Langtang Gosaikunda- Helambu (Melamchi) Trek; Second solo of 2017! 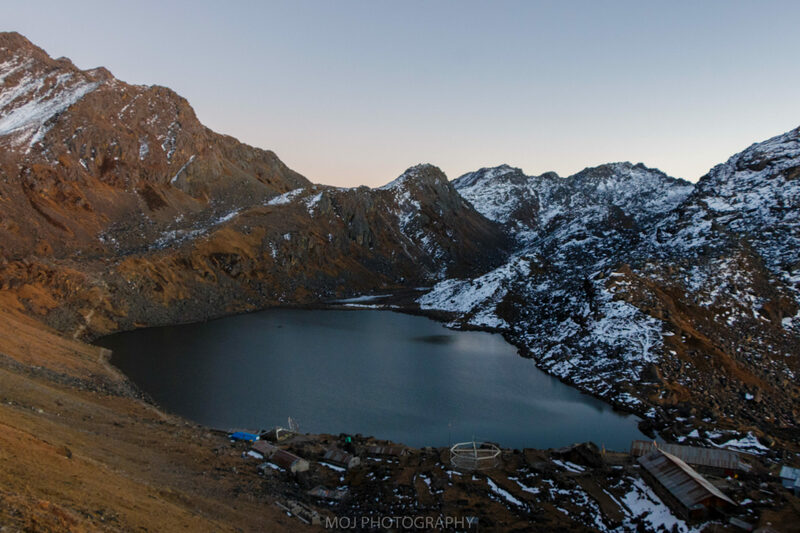 Gosaikunda Lake at an altitude of 4380 m is a very close trekking destination from Kathmandu. 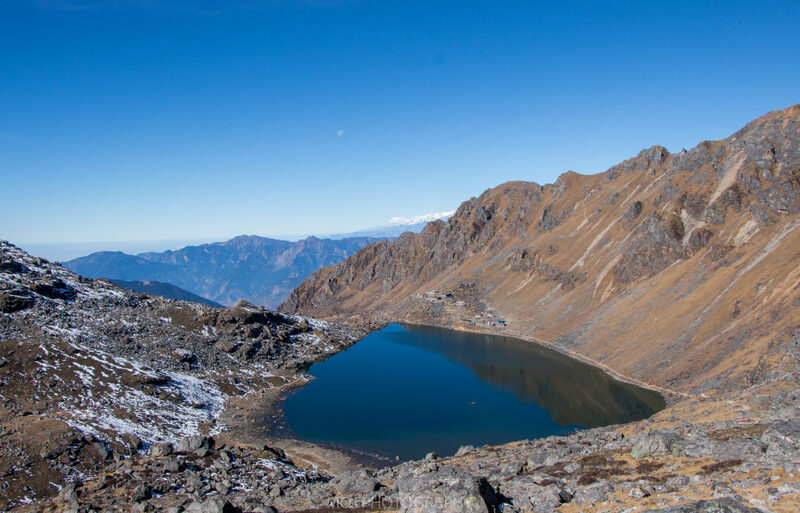 Gosaikunda Lake lies in Langtang region, Langtang National Park to the north of Kathmandu. Spiritually and naturally, this trek is getting a lot of attention in recent years. Thousands of pilgrims trek to Gosaikunda Lake each year on the full moon day of July/ August on the occasion of “Janai- Purnima” festival to take a holy bath. According to Hindu mythology, all the wrong deeds of people will wash away if they visit the religious lake of Hindu, Gosaikunda. 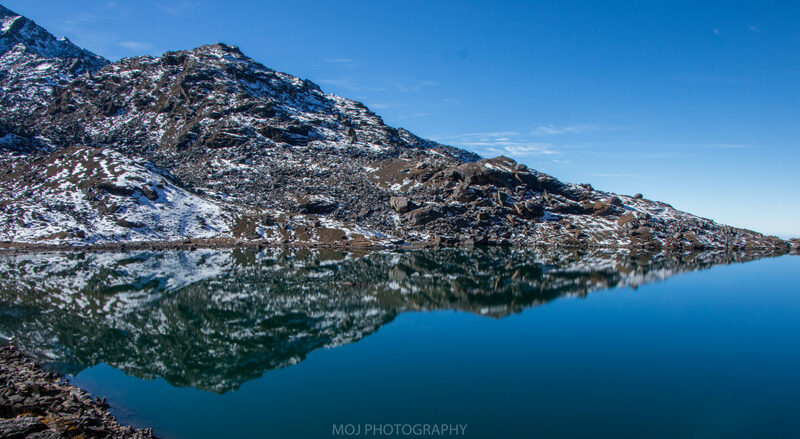 Hindus believe that the lakes Gosaikunda, Saraswati Kunda, and Bhairab Kunda were formed when God Shiva plunged his holy Trishul (trident in English) into the ground in order to extract water. 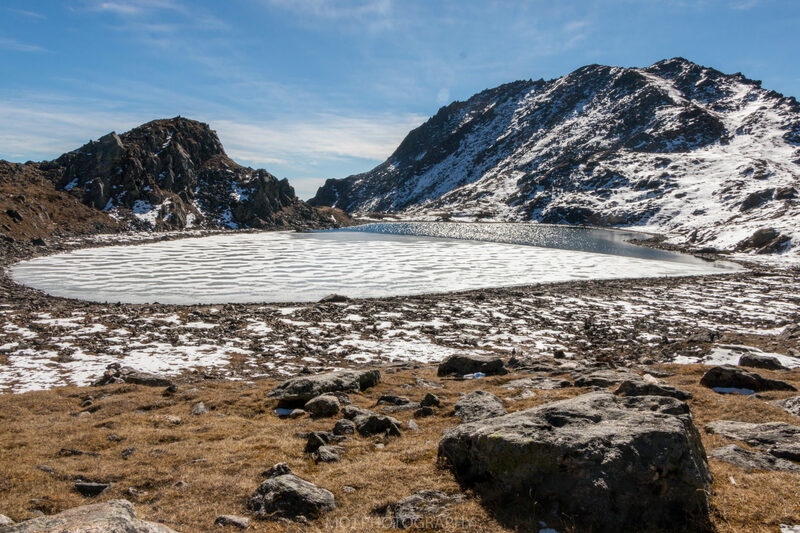 The Gosaikunda lake is commonly called “the frozen lake”. 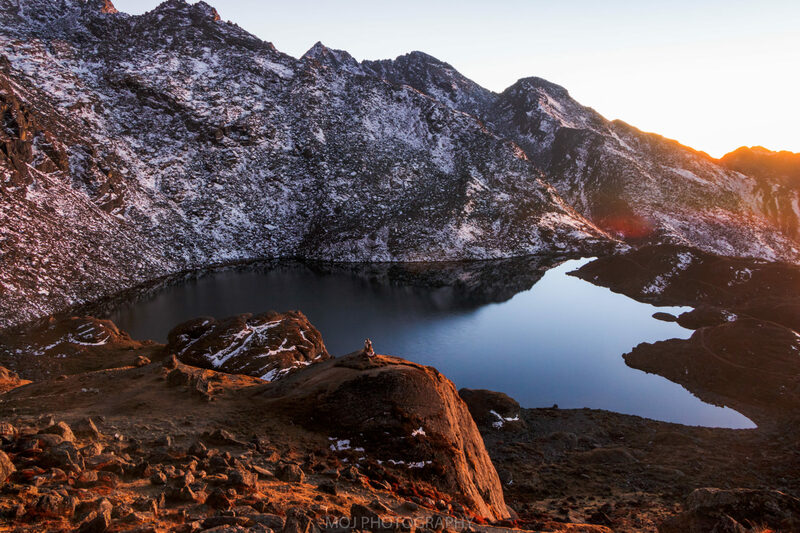 The best time to visit Gosaikunda lake is during the times of Spring (February / March to May/ June) when the rhododendrons are in bloom and in the fall (September to November / December) when the weather is temperate and the skies are clear. However, the trek is possible throughout the year. Gosaikunda Accommodation: Tea-houses with good facilities of food and shelter. The weather in Gosaikunda is pretty unexpected and variable. Even though the trek is possible throughout the year, a bit of preparation is required. It is very less likely to have rainfall during the spring season in Gosaikunda. Similarly, during the season of Summer (i.e. June to August) skies are unclear with heavy rainfall. Autumn season witnesses perfect skies and flowers blooming along with greenery around. It’s cold during the winter which falls from January to February. The lake is frozen and is covered by snow. Gosaikunda trek turned out to be my last travel for the year 2017. It’s the second solo travel of the year after Tsho Rolpa Glacial Lake Trek in Nepali New Year. Since it was a solo trip, I had a hard time convincing my mom to get approval. And that’s because of two main reasons; first, I was having a problem with my right leg from the previous week and another one was because of weather conditions (it’s getting really cold). Eventually, mom’s expectations failed and my stubbornness won. The trek was finalized only two days before it happened. So it turned out to be very unprepared one. Day 1: Kathmandu to Dhunche (around 8 hours of bus ride) and an hour of walk. Day 2: New Village Hotel & Lodge, half an hour away from Deurali to Gosaikunda ( around 7 and a half hours of walk). Deep sleep after a tiring bus ride the other day and I woke up at 8 in the morning. 4 guys had already left early in the morning. They were planning to Gosainkunda at any cost. I heard a few people talking outside of the hotel and asking if they could reach Gosaikunda that day. They seemed determined! Since I was planning to make this trip very slow with no rush at all, I did not set any specific destination and so, I was flexible. I got readied and tea was waiting for me. It was around 8:30 AM when I started walking. Chilly morning, serene walk and beautiful landscapes! Oh man, it was so mesmerizing. The only companions I could have a conversation with were the woodland of Oaks, pines, and rhododendron. 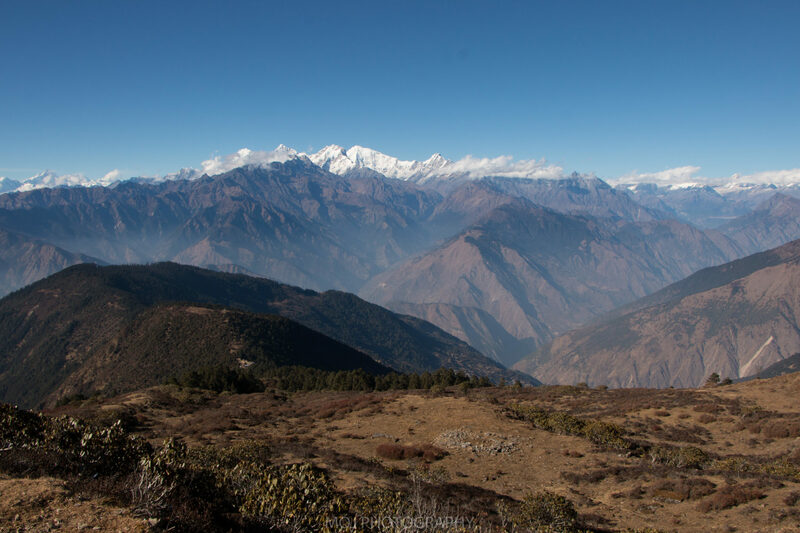 Uphill walking and the spectacular views of Langtang range had already begun. I reached Deurali and found a group of 5-6 guys whom I had heard talk in the morning. They were having a tough time walking and were already exhausted. After a brief conversation, I continued my walk and half an hour later, I met the four cool guys. They were having foods somewhere in the cool shades below Dhimsa. A moment of surprise for both parties! I didn’t expect to meet them that soon. Maybe they thought the same. After a short rest, we then continued the beautiful journey together. The uphill trail continues the tree-lines and lush vegetation behind for dwarf rhododendron and bushes. I stopped at Tea houses on the way for tea-breaks. The warmth of people made me stay for a longer time. And since those guys were walking slowly, I decided to walk on my own pace. We departed from Chandanbari making sure we’d be meeting again. It was only 2 PM when I reached Laurebina. I thought of staying there but there were no any people. The hotels and lodges were closed. 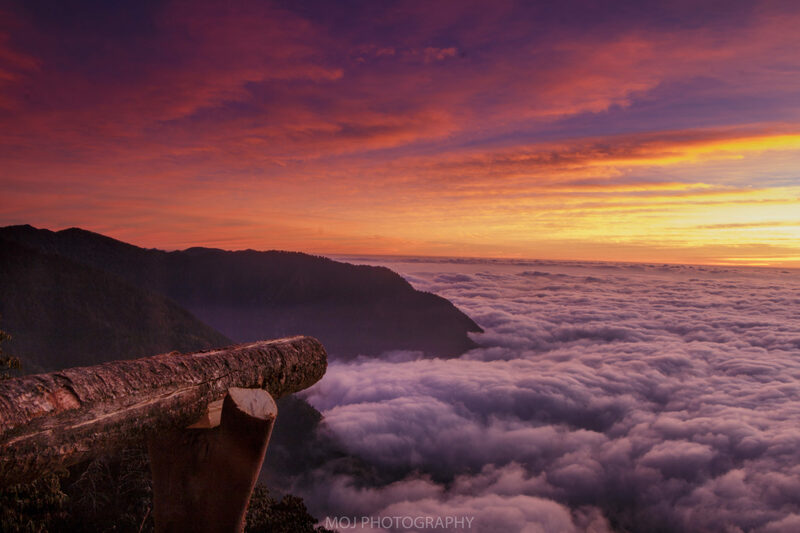 Since I had plenty of time before sunset, I decided to walk one more step further and it was until Gosaikunda. When I asked the fellow travelers about the timing, they told me it’d take me not more than 2 and a half hours. It’d be 4:30 PM. Weather was pretty clear and so was the mountain range views. Most of the times while walking solo, I used to feel the tiniest in the vastness of nature. But in this trip, I felt so vast from within! I was so grateful for everything. I’d stop while walking and felt like dancing. I danced as well. 🙂 With the pace getting slower, altitude rising and tired body, the mind got even serene and quieter than before. I was really really loving the trip. Everything I looked around seemed so beautiful and I used to feel content. It was around 4:30 PM when I reached Gosaikunda. There was only one hotel operating at that time because of fewer tourists traveling there. Right after reaching there, I sipped a cup of tea and prepared myself to shoot the sunset. After clicking loads of sunset pictures, I couldn’t resist staying there witnessing tranquility. The view of Gosaikunda and Bhairav kunda was mesmerizing! It got darker, colder and in turn, the food was waiting to be served. Ate the delicious dal-bhat and then I fell asleep as soon as I got under the warm blankets. During the treks, waking up after 8 was usual for me. That was what happened that day too. But when I got outside after waking up, the view was captivating. Reflections of hills around the lake, blue sky and cool breeze; how cool is it? While staying outside in the cold chilly morning, I could feel nothing but sheer freedom and grateful. Out of four cool guys I met earlier, there were only three. One of them had health issues and therefore couldn’t come to the lake. 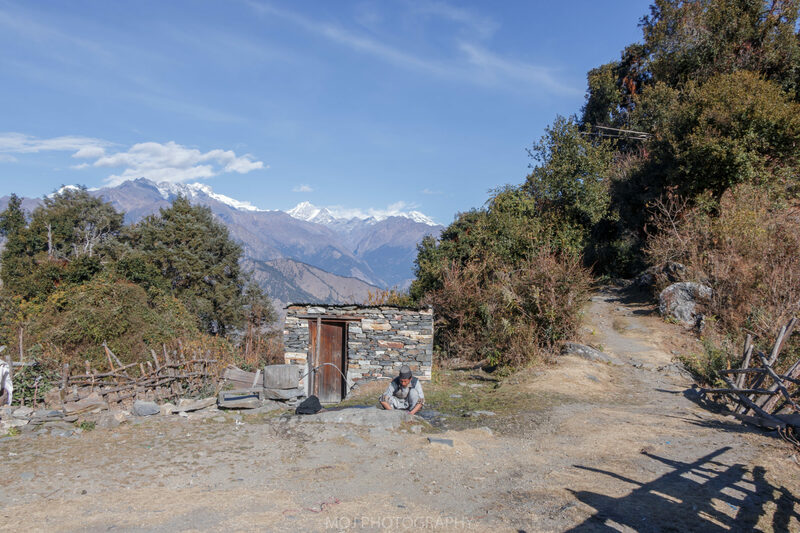 Even though they had reached half-way through Gosaikunda from Lauribina early, they had to return and stay in Lauribina. I stayed with them for some time talking about how amazing the trek had been and the beauty of nature! Sometimes later, I left and began walking. It was an uphill walk to the East towards Surya Kunda. Walked for more than an hour and still found no marks of any people there. In between the rocks and boulders, the trail reached Surya Kunda and the further walk took me to the last pass of Gosaikunda (aka the East Laurebina La). This pass is the highest spot of this trek. After reaching the top, a long descent brought me to Phedi 3,630m. I had my lunch there at around 12 PM. After a nice lunch break and lovely conversation with the hotel owner, the journey continued which is also the entrance to the Helambu region. Normal vegetation starts from this point and one can witness rhododendron and other alpine bushes. 3 hours of slow and steady walk from Phedi led me to Ghopte (meaning overhanging rocks, nature’s gift of a cozy shelter for pilgrims). There were few small caves formed by overhanging large rocks. Ghopte has two teahouses and one was closed. The hotel owner was a lovely person to talk to and there were other tourists willing to have the conversation as well. Soon after, it was sunset time. Every one of us got outside and clicked loads of pictures. The moment was so captivating that you wouldn’t take your eyes off. Layers of clouds below us, polluted-free colorful sky and a breath-taking sunset. What more to expect!!! I clicked hundreds of pictures as the colors of sunset kept changing. All of us were sitting around the firewood and reflecting the trek so far. There were parties; a German, a Canadian, hotel owner, me and a group of three Dutch sharing each other’s experience. Out of them, Canadian’s stories struck me the most. He’s a trekking guide back in his country and shared the stories of struggles while traveling. And those stories of hardships have certainly become a beautiful memory now. 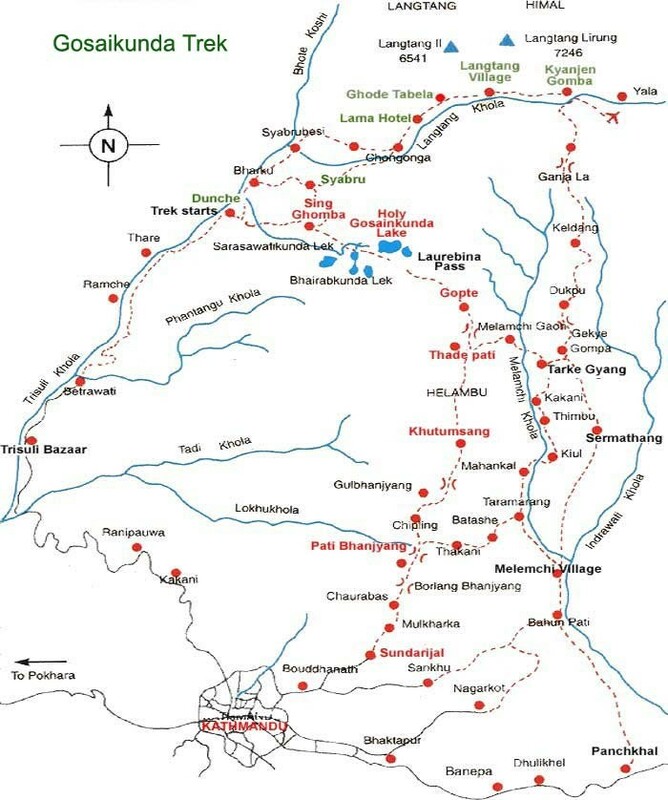 Further reading: Kalinchowk Travel Diaries 2016! After the morning tea and breakfast, I was about to leave Ghopte and the hotel owner told that I could easily reach Melamchi in less than 5 hours. If it’s so, I’d reach Melamchi not late by 1 PM and also thought of catching a bus to Kathmandu the same day. While other people had already left the place in a hurry, I was not in a hurry. In less than 2 hours, I was there in Thadepati. Felt like a good place to rest and click pictures; so stayed there for some time, drank a cup of tea there and moved again. Descending down east, the trail rapidly took me through small Sherpa village of Melamchigaon at an altitude of 2620m. When I reached Melamchigaon, I was really surprised. I was thinking I’d reached Melamchi Bazaar but it was Helambu. And when I asked people about Melamchi Bazaar, they told me it’s too far from there. One of them funnily said, “you’ll reach Melamchi in three days if you walk from here!”. I was shocked to know but that was what it was. I had two choices either I had to stay there in Helambu and take the bus the next day or else walk somewhere on the way to Melamchi. One of the guys said that I could reach until Timboo and it’s 3-4 hours walk from there. Also, I work some personal work to do and had to reach Kathmandu the next day by noon at any cost. So I decided to walk until Timboo. The woman who prepared food for me! A bit of walking and I stopped for a lunch break. There were 3-4 people working. I had a conversation with them and they told me about the village. Due to the name of sacred Helambu valley, the Sherpas living there are called Hyolmo. It is also famous for apples and artistic Buddhist monasteries. The fifth and final day of the trek was all about the bus ride from Timboo starting from early in the morning at 6 AM. Bus ride continued until Kathmandu through Melamchi Bazaar, Zero Kilo, Dhulikhel, Banepa, Surya Binayak and Koteshwor. Because of traffic jams, road situation and too many frequent stops in between, it took me more than 7 hours to get to Kathmandu. 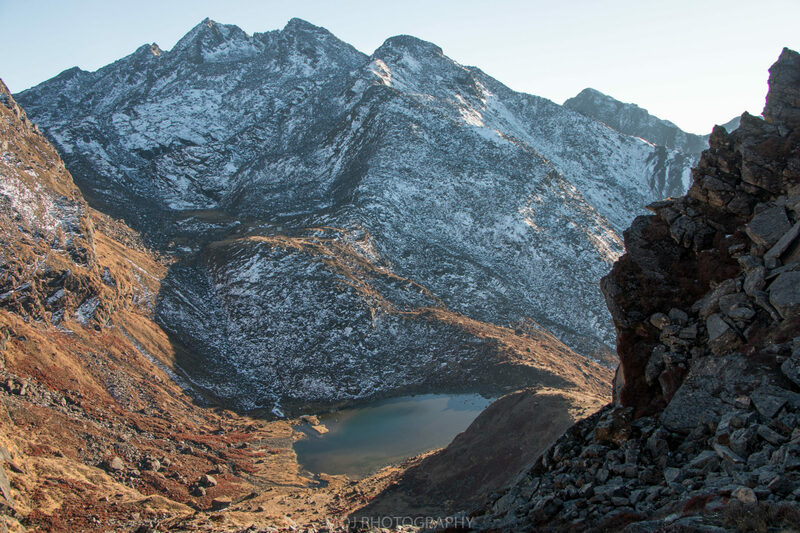 The total cost of this trek to Gosaikunda was less than NRs. 6ooo (i.e. $60) which included all the expenses (transportation, foods, accommodation and for some petty expenses like sunglass, first aid etc). If you’re a foreigner, the cost is going to increase because of the fact that you need to get trekking permit and the expenses for food and accommodation is slightly more as well. the picture of Gosaikunda lake is superb beautiful and clear blue lakes, i still remember lauribinayak climbing is toff.